One of the best things about Asia is that it is so very close to… well… Asia. On a recent trip to see family in the Philippines, I took the opportunity to fly to Vietnam , only a short two hour hop from Manila. This was a part visit with an old work colleague and an adventure for myself. 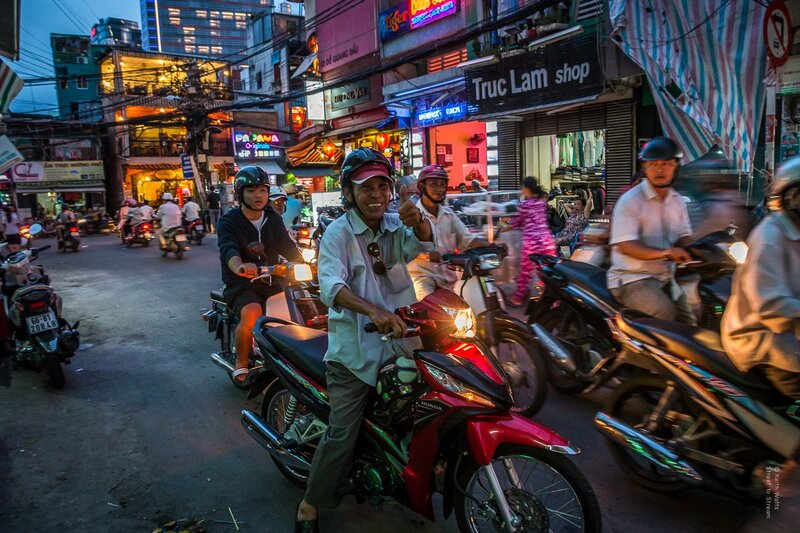 I arrived in Ho Chi Minh City in the middle of the night having left Manila at around 10:30 pm. I had previously purchased a visa via the telephone while in Manila and now had to pick it up as I entered Vietnam at the airport. There was a short queue by the time I arrived even though I had packed light and had no checked luggage. I settled in to wait my turn. Fortunately, it wasn’t too long a wait, but by the time I had cleared customs with my newly stamped and stickered passport, I was bone weary. This proved to be a small disaster, as my friend Alex, had emailed me instructions on how to avoid being ripped off by the more scurrilous taxi drivers in the city. I stumbled through to the waiting ranks and told a porter where I needed to be. He didn’t understand too well so I gave up and got into the first decent looking cab I saw. This is where it all started to unravel… The price he gave me was about four times what Alex had told me was fair. By the time this surfaced in my brain, we were well on the way to the city. I decided to try and negotiate…..
My erstwhile fluent English speaking cabbie suddenly forgot every English sounding syllable he had ever learned and it was only when I pulled the international incident card that he relented and handed back the difference. He dropped me at the end of an ally and I had to negotiate some rough looking diamonds who were loitering in the area. After safely arriving at the hotel, a weary manager showed me to my room and I sank thankfully into my bed. The hotel was called the Bich Duyen and was comfortable and price friendly. I realised that I would be needing a third night before I headed south to Vung Tau to visit Alex but was told they were fully booked. They phoned a sister hotel and arranged a night for me there. Same price, same conditions. 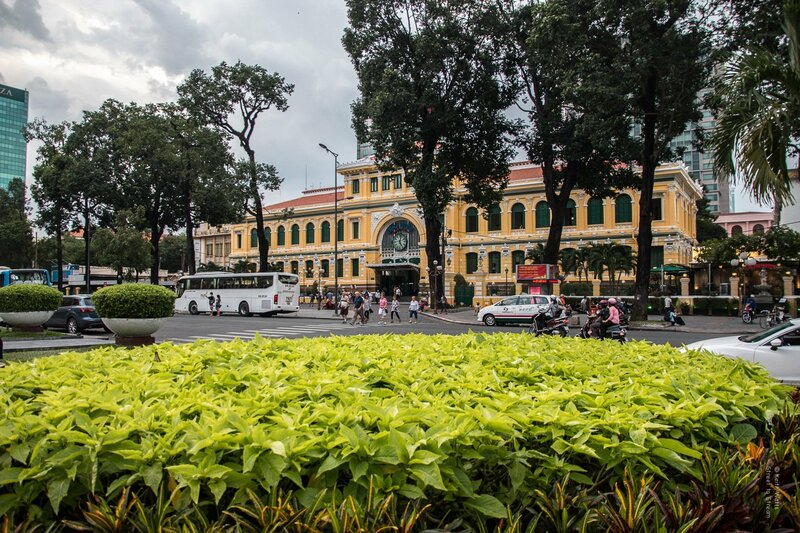 The first day I wandered the streets of Saigon’s District One looking at the touristy wonders and trying to avoid being ripped off by the many hawkers trying to make a living off the many tourists visiting the city. I was looking for a shot of a world globe that sat atop a tower. The sun was behind it and I was having difficulty in getting the settings to work. This guy (In the stripped shirt) was hanging about making me a bit nervous as to what were his intentions until he simply came up and began to shine the straps on my thongs. “A” for persistence… He simply would not take no for an answer. Of course, one spends some time in the markets when on holiday, and one of the bigger ones in town was just down the street from the hotel. Ben Thanh Markets Cover an area the size of a large street block, and the walls were packed with goods of every shape and size. Being a foreigner I was the target of every seller hoping to tempt me with their wares. I visited the War Museum, locally known as the Museum of American Atrocities. This was an interesting place but one where you need to keep an open mind and remember that it is only a shrine to history. One could spend many hours here without seeing it all. I had been walking somewhat aimlessly for several hours and I began to tire. 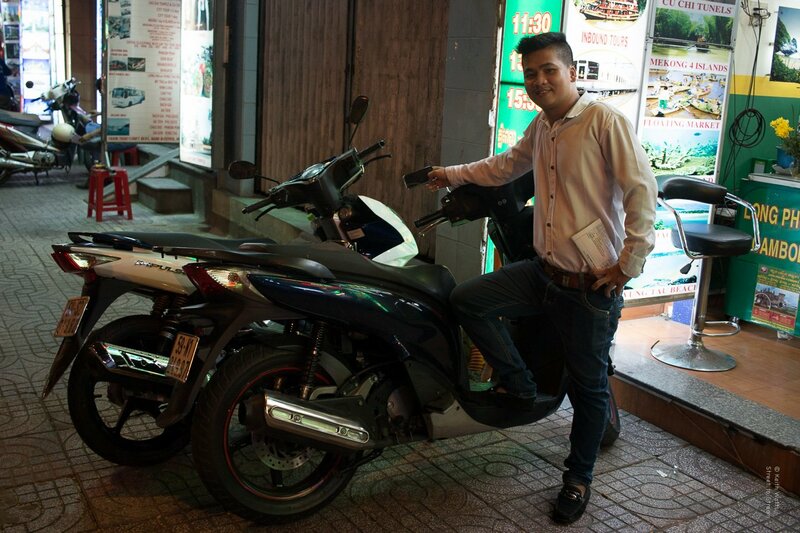 I was approached by a guy on a motorcycle who offered to take me around the main tourist attractions. This involved a trip through the middle of a very busy multi-laned roundabout. The traffic ebbed and flowed around us and the ride was both exhilarating and frightening at the same time. 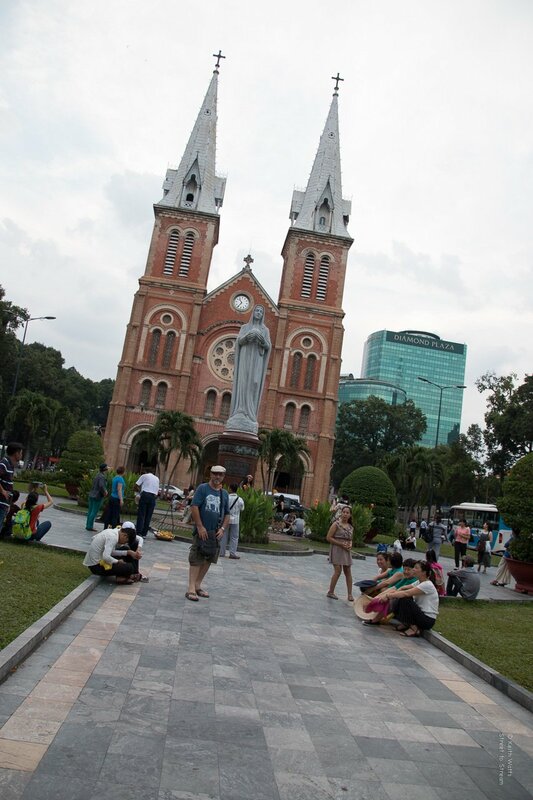 He took me to the cathedral called the Notre-Dame Cathedral Basilica of Saigon where I reluctantly handed him my camera so that he could take a photo of me standing in front. I was prepared tat any moment to have to run him down in case he made a dash away with my camera, but in the end, I had judged him too harshly as he cheerfully handed the camera back and pointed out some good photo spots near the old Central Post Office over the road. He was obviously in the employ of a certain “massage” establishment as we seemed to drive past it on a fairly regular basis with him extolling the virtues of the ladies inside.. Eventually, darkness fell and he delivered me to my Hotel where he insisted on picking me up again next morning to take me to, even more, attractions across the city.